We ship to 47 Continental States in USA. 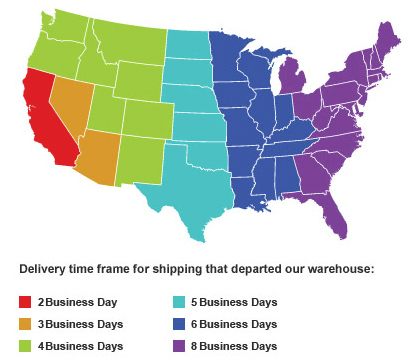 We can also ship to Alaska and Hawaii although transit time and rates may vary. Customer will need to call in for details. Most of the time we are able to offer free standard shipping on all items to 47 continental states. 95% orders are qualified for free shipping. However, due to excessive delivery rates to certain areas, a freight charge may be required. Our customer service reps will contact you if there is a shipping surcharge on your order. Please call 855-623-6686 for freight charge​. It is your responsibility to inform us if you plan to ship your order to the following locations. There will be a limited access surcharge for the delivery. Camps, carnivals, fairs, chautauquas, churches, mosques,synagogues, temples, convents, schools, colleges and universities without a dock, medical/urgent care sites without a dock, prisons, construction sites,individual/mini storage units, mine sites, golf courses, country clubs, nuclear power plants, military bases/installations, pars, farms, ranches, Indian reservations, day cares, hotels, motels, bars, night clubs, cemeteries, outdoor flea markets, retirement/nursing homes. Please be advised that due to liability issues, the delivery driver will not be able to assist you in any way with the removal of your fully assembled trike from the truck bed. Additionally, the delivery driver will not help to remove the crate from your trike or dispose of any of the packaging. For unit shipments, we use freight truck companies with semi-trucks to pick up shipments from our suppliers warehouses to deliver them to the curbside of your residential delivery address. The freight truck companies usually call residential customers to schedule a delivery appointment as they will want to make sure the customer will be there to sign for the shipment when it is delivered. Once the shipment is picked up by the freight truck company, we will email you the tracking information. Once you receive that email, you can contact the freight truck company directly to discuss scheduling your delivery appointment with them. A valid phone number and address is critical to ensure on-time delivery of your order. For accessories and parts, we ship with various carriers such as FedEx. Shipping Address & Delivery Phone No. 1) Please provide us with the most up-to-date, accurate and detailed shipping information with your phone number. If the item is returned because it was not deliverable due to an incorrect address, the customer will be responsible for both the shipping and return charges. 2) We do not re-consign an order once it is shipped. 3) A valid contact phone number needs to be provided when placing the order. It may cause delay or even return of product if invalid phone number is provided. Customer will be responsible for all additional cost. 4) After you place an order, if you want to change your shipping address, please contact us as soon as possible. Address can be changed when the order has not been shipped out. Please note that we will ask you to follow our credit card verification procedure if you change delivery address after we’ve processed your credit card. 1) It takes approximately 24 to 72 business hours to process and ship your order once it is confirmed and the payment received. Orders received on Saturdays, Sundays and public holidays, as well as orders received on weekdays, will be processed the next business day. We don’t ship on Saturday, Sunday or national Holidays. During busy seasons, it may take up to 5 business days to process your order due to high volume of orders. 3) If your billing address and shipping address does not match, or if you change your delivery address after placing the order, we’d need you to send in both copies of the driver’s license and credit card. 4) A valid phone number is very important to avoid any delay in processing your order. 5) Your items may be shipped separately from different warehouses and arrive at different times. 6) For shipment to Hawaii, Alaska, please email us or call us at 855-623-6686 for shipping fee confirmation. If you choose to submit order prior to contacting us, we will email you the shipping fee and your order will not be shipped until we receive further confirmation from you. 7) Please note that any shipping time stated on our website or given by customer service representatives are ESTIMATES only. We will make every effort to make sure you receive your order in time, but we are not responsible for shipping delays, which can be affected by the shipping carrier, delivery destination, weather, holidays or incorrect/insufficient delivery information. Please note this is the transit time for the trucking company to deliver the order once the order is processed. You can track and monitor your shipment on the trucking company's website.